This week I had a rare encounter with a knitter on the train to work. Every now and again I see knitters and crocheters on the train and sometimes there’s a smile of acknowledgement, but usually there’s not even a glimmer of recognition that there’s a shared interest. That doesn’t bother me too much because I generally like to keep to myself and I don’t see knitting or crocheting on public transport as any different to commuters who play games on their phones or read; it’s a way to pass time while getting to your destination. This week, however, a fellow commuting knitter started up a conversation about knitting. Even though I tend to keep to myself, I also don’t mind engaging in a little bit of knitterly banter. So with one paragraph I somewhat shun the community attributes of knitting, and in the next I’m somewhat embracing them. What can I say, I’m a complex individual. It was a pleasant conversation, but when the conversation inevitably lead to ‘what are you knitting?’, their response to my answer got me thinking. That day I was working on a swatch for a future project, and the response was sympathetic but negative, like swatching was a necessary burden. But is it really? When I first started knitting, I avoided swatching. I just wanted to proceed to the main event and didn’t want to deal with trifling matters of gauge and fit. If the required yarn was 8ply and I was working with 8ply, then that was more than sufficient preparation. After the inevitable happened and projects ended up ill fitting and looking downright hideous in some cases, swatching became part of the normal knitting routine. 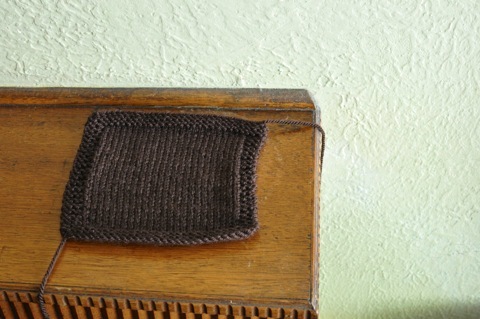 Now I don’t even think about it; if I’m working on a project where gauge is important, then I need to knit a swatch. Ultimately I’d rather spend a couple of train trips making sure the yarn/needle combo is right for the pattern than spend many hours on a project that doesn’t work because the gauge is off. I guess it all comes down to preference so neither way is going to be objectively right or wrong, but I am interested to know what the popular opinion is about swatching; is it really all that tedious? As for the swatch, it was made in preparation for some travel knitting I plan to take on a holiday Matt and I will be going on next week. Last year, a knitting book I bought at the Brunswick Wool Expo contained a pattern, a jumper with a high v-neck, that prompted thoughts of spending this year knitting only from vintage patterns. That plan hasn’t really worked out as there are a few ‘modern’ projects that have stuck around from last year. Little by little though, I’ve been finishing the modern projects (and then taking my sweet time photographing and writing blog posts about them) and casting on projects from vintage patterns. Back when I was pondering what colour to make the jumper, light yellow, mustard and brown had made my short list. Then Bendigo Woollen Mills decided to discontinue their nice dark brown colourway from their Luxury line, leading to a little bit of panic buying. So, I can thank Bendigo Woollen Mills for making the decision for me. Even though it’s just a rectangle of stocking stitch at the moment, I’m really looking forward to properly casting on. I think I’ll get a lot of wear from it and it’ll go with a lot of my other clothes. I’m almost looking forward to the long flight we’ve got ahead of us, just so I can spend some quality time with it. Given that I’m no fan of flying, it goes to show that this swatch has some pretty magic qualities! I think that brown is a lovely colour. I hope you have a wonderful trip! I LOVE swatching. I can spend a whole day just making swatches to see how different yarns behave with the intended needle size and stitch patter. I also used to just think “hey – it’s 8ply – what could possibly go wrong”. I was cured of this after months of work on a mens size XL jumper netted a knitted circus tent. Lots of potential in a beautifully knitted swatch! What lovely even tension you have.